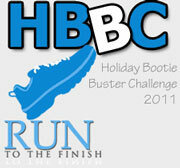 Well, Week 3 of the #HBBC was a bit of a dud, but there were a couple of successes as well. Visited The Russian Museum of Art with my Russian history class. It was fascinating, but somehow it kind of drained me. I was pretty worthless after returning. Well, I do think I got *some* homework done. Ran 7.5 miles - On the treadmill. I was not looking forward to such a long run inside, but I didn't want to run out in the cold, either. I brought A Bug's Life to watch and that helped a LOT, but next time I need to find something a little more engaging (i.e. something I haven't watched a million times already). After my run, I felt like I was positively gliding on my walk home. Bonus! This was my designated rest day. Aaaaahhhhh!!!!! I got distracted after work doing something on the Internet, I suppose. Boy, this week was really off to a rough start! Ran 2.6 miles - Outside. It was a beautiful afternoon!! I couldn't resist taking Sallie out for a run. I'd intended to go 4 miles, but her little tootsies kept getting too cold. She had to stop several times to lick out the snow/ice. Before you think I'm a bad doggie-mom, we turned around after the first time she stopped. Poor girl. Ran 3 miles - Back on the treadmill. Mostly I just don't feel comfortable running outside when it's dark, and I can't clearly see the ice patches on the ground. I was attempting 4 miles to make up for the miles I missed the day before, but just around 3miles, the power went out at the gym. Well, the whole neighborhood, actually. I'd intended on visiting the weight room, but once the power went out, I headed home instead. I ate 7 servings of fruits/veggies! I. am. shocked! This was another designated rest day. Aaaaahhhhh!!!!! I ate 7 servings of fruits/veggies TWO days in a ROW! Yes, I'm as shocked as you are that I managed to get in 7 servings of fruits/veggies TWO days this week. I find that it's much easier to accomplish if you have a plan. Making a meal plan ahead of time is really something that I struggle with. It's so time consuming! Towards the middle of the week, I decided to stop fighting it and let SparkPeople do the work for me. They have system generated plans that are super easy, super filling, and loaded with fruits/veggies. It makes it tons easier to just bring up the website and know what I'm going to make. If I don't like something they suggest, it's super easy to swap out the entire meal suggestion or just one of the components. I've also discovered MyPlate. This site is produced by the USDA and is a great resource. I haven't spent too much time on the site yet, but it appears you can create meal plans and track your foods. I think you need to sign up for an account of some sort, of course. They also have something they call MyFood-a-pedia where you can look up over 8,000 foods for nutritional info. You can even compare two different foods. There aren't name brands, but it's more general in nature. I think I'll play around with the site more in the future and do a full write-up/review of the website at that time. Have you visited the MyPlate website? What do you think? Do you plan out your meals ahead of time or just wing it? Wow! What a week you had. I am impressed. Mine wasn't nearly as successful. I like that you were able to eat 7 servings of fruits and vegetables twice this week. That's awesome! Keep up the good work. Wow - you've really done a lot this week. Way to go! Good job on your HBBC points. I wouldn't run outside in the dark and ice either. Not safe. Thanks, Treva. This week, I'd like to try and get at least one point every day. I hate seeing those zeros. I've never gone on those websites before but I might just check them out! I'm curious about My Plate and My Foodapedia. Thanks for the links! Oh I'd never heard of either of those links, but I'm checking them out as we speak. Thanks!! Jill - Thanks! Tell me more about clean living. Neon Blonde Runner - Hope you found them to be helpful!